A common thing to see in a design are visuals that break out of the main content column. 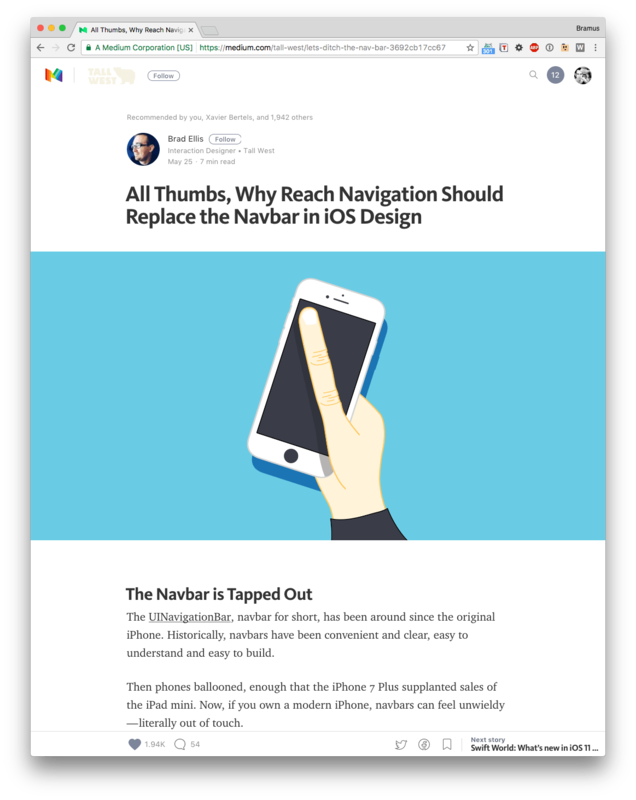 You most likely have already seen this kind of design over at Medium for example, where it’s common for the main visual to be full width (or “full bleed”), whilst the content remains centered. Last week, whilst attending CSS Day I learnt of a technique I hadn’t seen before to solving this problem. To make the .content--fullwidth element break out of its parent container .main, I use a technique where I stretch it out so that it takes up the outer 100% again, and then recenter it. A width which is the inverse of the width of .main to stretch it out. A negative translation on the X-axis equalling half of the remaining width to correctly position it. See the Pen Breaking elements out of containers, technique #1 (inverse width + translate) by Bramus (@bramus) on CodePen. When using CSS Grid, you have much nicer option. Last week at CSS Day I saw Rachel Andrew give a nice demo on how to break a set of images outside of the “content column”. The containing content is then placed inside that 2nd column. Breaking the .content--fullwidth element out of its parent container .main now becomes rather easy, as only has to make it span all three columns. 🤔 Huh? 4? Shouldn’t that be 3? See the Pen Breaking elements out of containers, technique #2 (CSS Grid) by Bramus (@bramus) on CodePen. If you’re using CSS Grid then Rachel’s technique will come in handy. For projects in which you need to support older browsers, you can still rely on the first one. 💁‍♂️ New to CSS Grid Layout? Rachel has got you covered with her excellent Grid By Example.